Authoritative analysis of how the justices’ “quirks of personality and temperament” have shaped American law and made the Court one of our strongest institutions. Rosen (Law/George Washington Univ. ; The Naked Crowd, 2004, etc.) traces the Court’s evolution through the stories of four pairs of personalities and their clashes over important issues. The most successful justices, he argues, have been “institutionalists”: effective leaders and consensus-builders who are modest, likable, able to find common ground and more concerned about the legitimacy of the Court than their own interests and agendas. The least successful justices have been insecure, heavy-handed “loners” more interested in personal glory than in quietly getting things done. Specialists will appreciate Rosen’s examinations of these conflicting judicial temperaments at play during different periods in history; general readers without a solid grounding in constitutional issues may feel lost. The basic differences animating these clashing duos are made clear. Crafty and appealing Chief Justice John Marshall managed time after time to outfox his introverted, thin-skinned political opponent, Thomas Jefferson. Gregarious Justice John Marshall Harlan won out on the issue of majority rule over darker, more ideological Justice Oliver Wendell Holmes, Jr. The persuasive Hugo Black, deeply devoted to the institution of the Court, proved far more influential on key issues than undisciplined, self-destructive William O. Douglas. 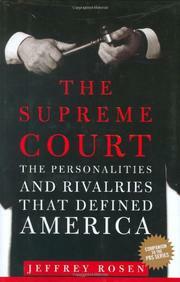 Of modern conservative justices, Rosen finds that the pragmatic William H. Rehnquist was much more respected within the Court than Antonin Scalia, a rigid purist. A concluding chapter based on an interview with Chief Justice John G. Roberts, Jr. suggests that he may have the temperament of his successful predecessors. An illuminating look at the human side of the highest court.